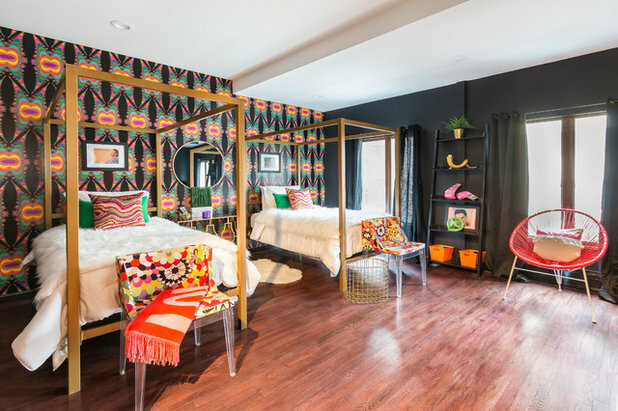 At home design expo Design Chicago this month, Sherwin-Williams director of color marketing and design Michael Plank broke down his team’s forecast for the color trends that will dominate design in 2019. 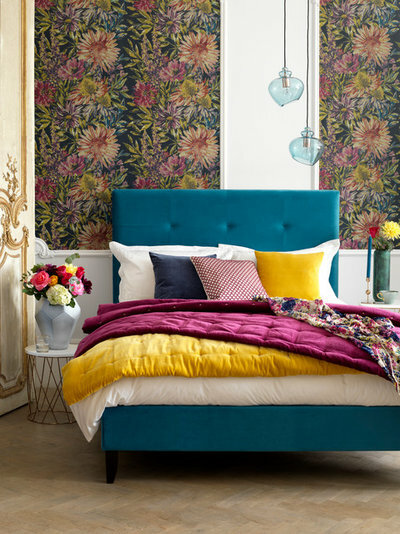 Among the hip hues Plank sees taking off in the coming months are sun-washed oranges and tans inspired by the American West, rich galactic jewel tones and, maybe most eye-poppingly, a mix of vivid purples, golds, reds and emeralds. Color maximalism and the idea that “more is more” when it comes to color, Plank says, may soon have its moment. 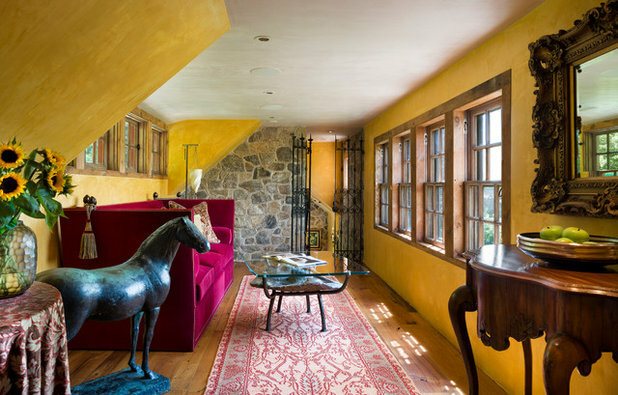 While gray and white walls and finishes are still a homeowner favorite, some designers and color experts say they’re seeing more clients open to the possibility of vivid color. 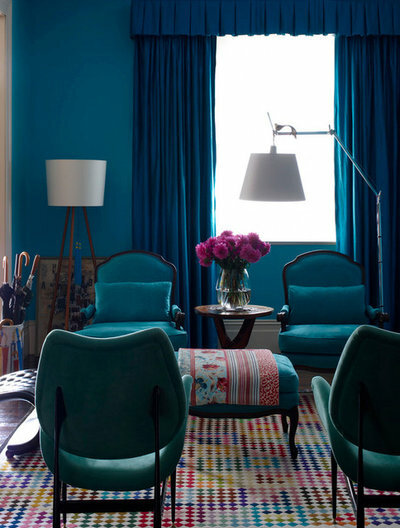 Opting for a rich spectrum can give a space an emotional as well as practical boost. Decorative artist Heidi Holzer of Heidi Holzer Design & Decorative Work in Connecticut says dark colors in particular can come in handy as striking backdrops and to camouflage mundane pieces such as TVs and exercise equipment. More vibrant shades, she says, are just as useful for bolstering moods. Maxed-out color inspiration can come just as easily from a wildflower bouquet as it can from a favorite glass vase. 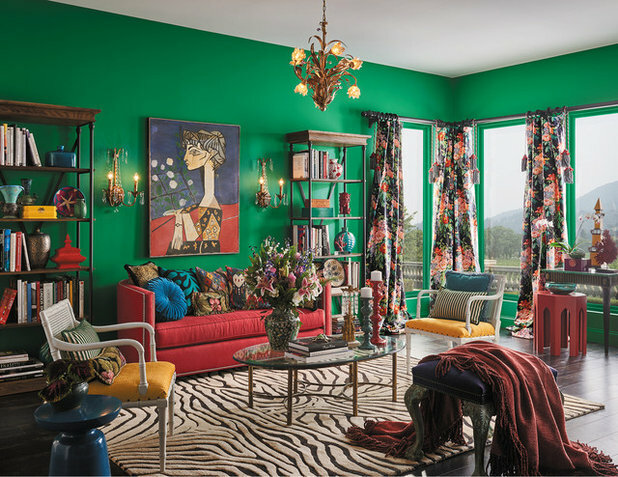 Holzer says she looks to nature as well as well-loved pieces such as velvet armchairs, braided rugs or window treatment trim that a homeowner already has to drive her colorful work. If you’re still not finding a palette you love, Florida interior designer Tracy Stern suggests exploring a paint store and collecting swatches that speak to you. Once you’ve landed on the colors you want to play up, figuring out where to show them off can be a challenge. Here are a few high-voltage ideas. Small space, big wow factor. 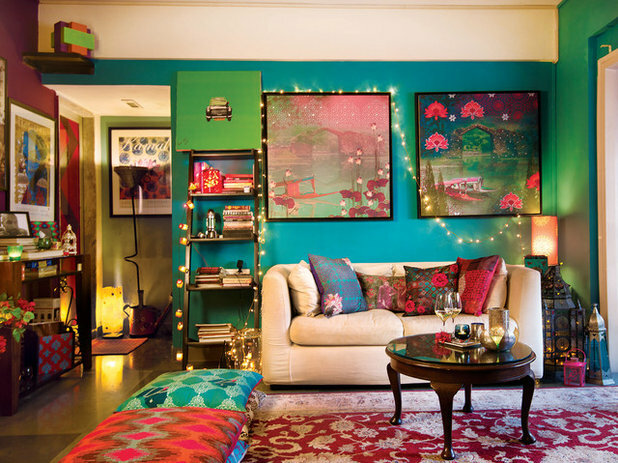 Incorporating a lot of color and pattern into a small space can be a good starter project for homeowners who like the look of bold color combinations but aren’t quite ready to commit a full-size living area to it. 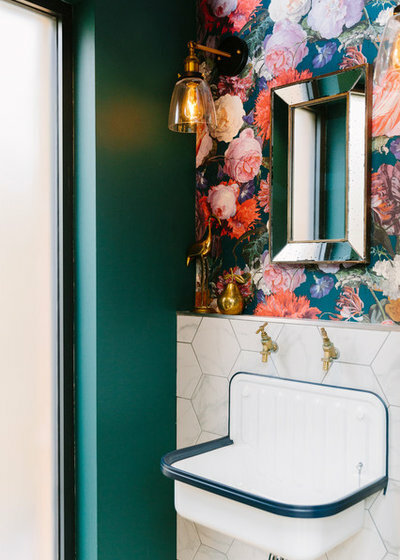 Stern recommends experimenting with a powder room by mixing colors, patterns and adventurous wallpaper. A designer can help find the right combination. “I like the peep-show quality of surprise when you open a door to something dramatic,” she says. Celebrate the ceiling. 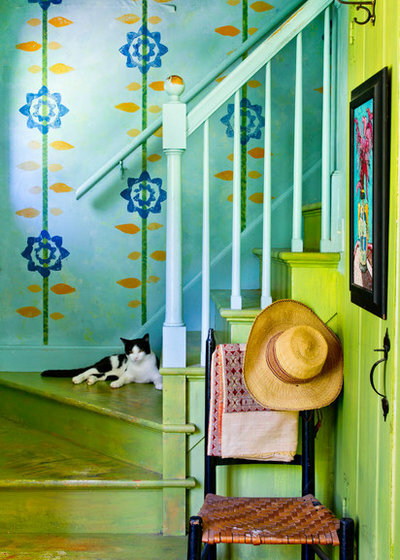 The ceiling is another area where an unexpected burst of color can go a long way. “It’s a wonderful place to add color that is less intimidating but also a great conversation starter,” Holzer says. Consult with a design pro to echo the overhead pop in throw pillows, art and other accessories, as shown here, or anchor other bright colors throughout the room. Concentrate the color. 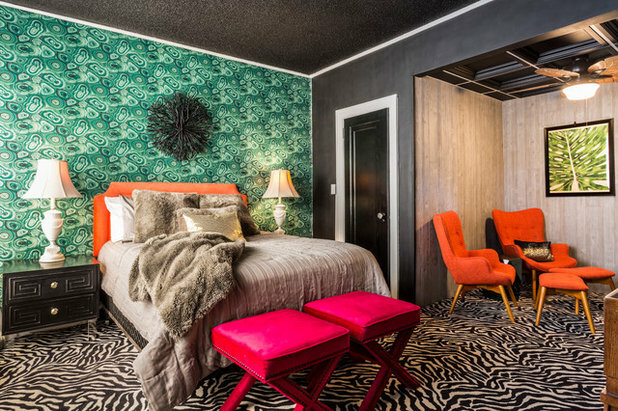 If the ceiling doesn’t feel like the right place to go all in on color, a feature wall, like this one with emerald wallpaper, can create a major statement and focal point for the space. Here, equally powerful doses of color in the headboard, chairs and bench keep energy spread evenly throughout the room. There are no set rules when it comes to over-the-top color. Instead, designers suggest homeowners embrace the combination that brings the kind of energy they’re looking for into a space. That can mean taking into consideration things such as texture, scale and the room’s lighting during the time of day the homeowner expects to use the space most.